Tricycle and first balance trainer in one. Switches easily from 3 wheels to a 2 wheel balance bike without tools. Seat opens up as a storage box and also functions as a carry handle. High Quality ABS plastic frame and silent anti-skid TPE wheels. Suitable for both indoor and outdoor use. Maximum user weight 25kg. Recommended for ages 12 months +…. This toy costs approximately £34.99 (for the latest and best prices make sure you check our retailer list for the Bunzi Balance Bike Pink above). 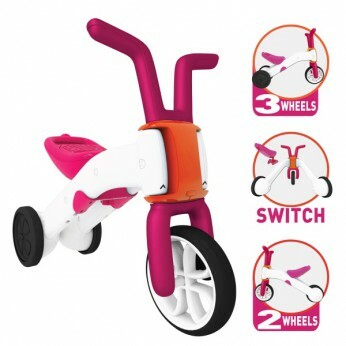 In our review of Bunzi Balance Bike Pink we classed it as being suitable for ages 1 to 3 years, 3 years, 4 years but recommend you check the manufacturer specific advice before purchasing.